350 sq. 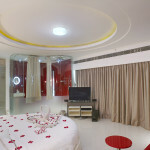 ft. with 2 balconies – is located on the 1st Floor and has the view of the swimming pool and the entire property. Overlooking the entire property, this spacious suite features a delightfully comfortable round bed, a glass-walled bathroom and a balcony overlooking the pool that make you wonder if you ever want to leave.